The last few days I’ve been exploring the CLI and doing a bit of NodeJS code at the same time. Today, I want to continue on that theme and fulfill a real scenario that my friend and colleague Mike Taulty asked about a few months ago. Mike asked (paraphrased): “It would be cool if there was some tool that would receive or poll for logs so, during development, I can just refer to my log watcher window to see that latest logs. Is there a way I can do that?”. Today, we’re going to use the new CLI and node to build this. Once again, we’re going to use NodeJS to write a small console program that will invoke the CLI to poll for logs for a given service, and only show new logs since the last poll. 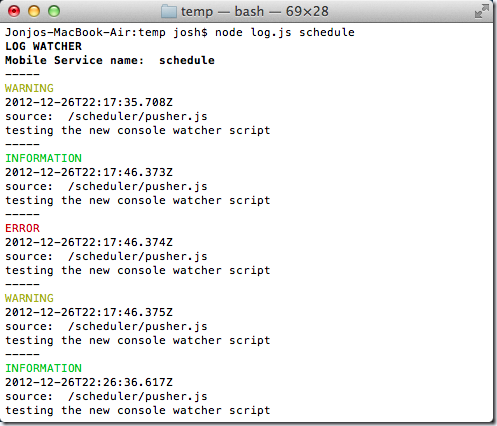 One of the great things about using NodeJS for this is that it will work on both Windows and Mac. This day 6 of the twelve days of ZUMO. Tune back tomorrow for more!